Emerging geographies of hinterland: Chennai as a city, metropolis, region and what else? Amidst recent preoccupations to gain a better conceptual understanding of peripheral urbanisation, this paper makes a case for exploring the hinterland as a critical analytical category to capture the capturing unfolding processes of contemporary (capitalist) urban transformations. Arguing that the hinterland goes beyond the established binaries of twentieth-century urbanism where the notion of centre and periphery are still tied to the increasingly questionable urban/rural distinction, it maintains that the hinterland is central to recent efforts in generating a new epistemology of the urban. 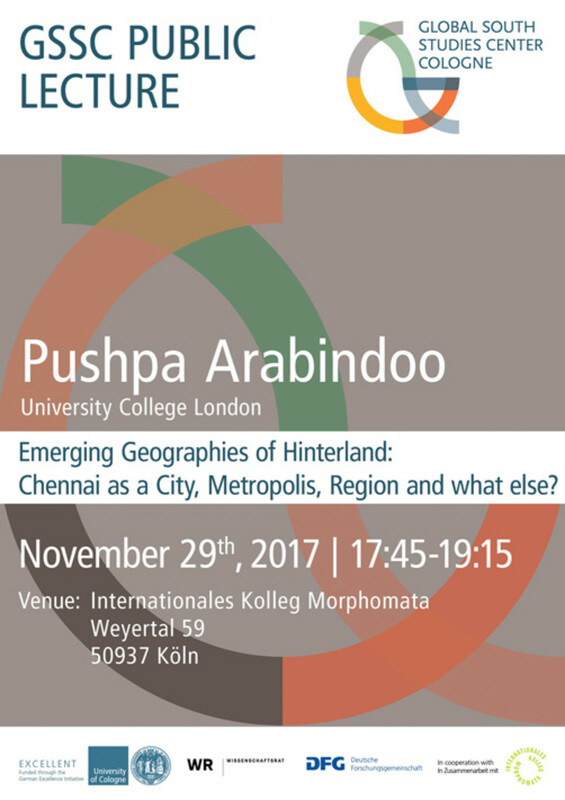 I will explore what this means beyond a theoretical abstraction through my ongoing research in the Indian city of Chennai, where an intricate network of new economic geography plying its hinterland requires us to abandon our conventional understandings of Chennai as a city, metropolis or region. More importantly, what the hinterland demands is not a mere rescaling of the urban question, but addressing the renewed geographies of uneven development that are more a consequence of a murky politics of the ‘land question’. Even as its multiscalar geography creates all kinds of planning quandaries, Chennai’s hinterland reveals an operational landscape where an abstract network of logistics and global supply chains takes precedence in a territorial neo-colonisation that extends beyond the expanding interests of the city. There are methodological challenges related to how one undertakes a study of this expanded scale as we are compelled to draw on different kinds of urban imaginations ranging from the physiology of landscape and ecology to the politics of land and territory. Pushpa Arabindoo is a Senior Lecturer in Geography and Urban Design at the Department of Geography, University College London. She is a co-director of the UCL Urban Laboratory and an editor of the City Journal. She has an inter-disciplinary background in architecture, planning and geography. Her research focus is set in the Indian city of Chennai where she has been conducting ethnographic investigations into its urban transformation uncovering politics of middle class, evictions and resettlement of the urban poor, infrastructure projects around water and nature, and the broader concerns of development planning. She is currently a EURIAS junior fellow at the Paris Institute of Advanced Studies for 2017-18.